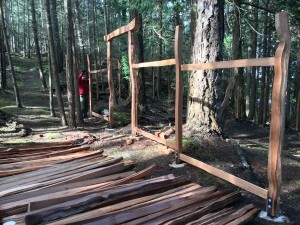 This winter I had the opportunity to build a very unique fencing project on Pender Island. 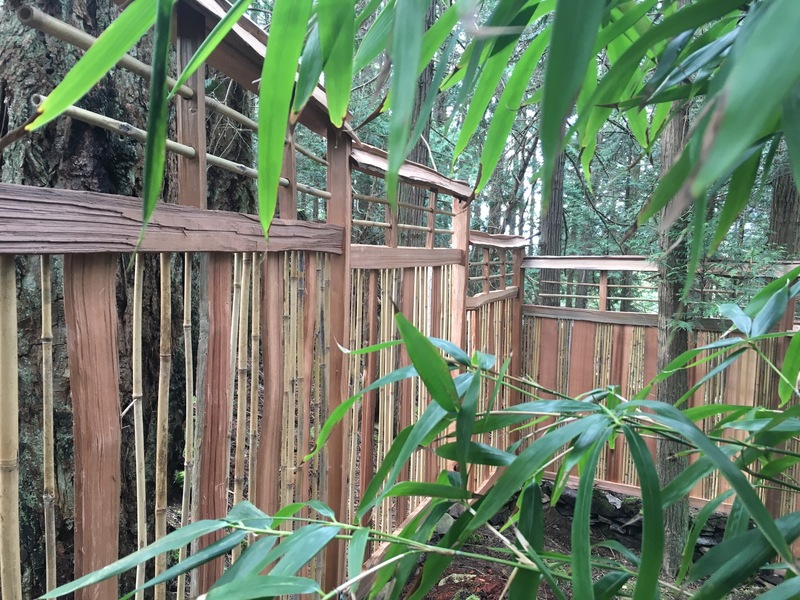 A new client had planted a bamboo grove on their forest property but was having issues with the deer eating the young bamboo (which they normally do not eat) so called me to talk about fencing the grove. 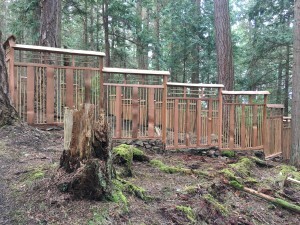 We discussed the idea of doing a Japanes style fenced courtyard. 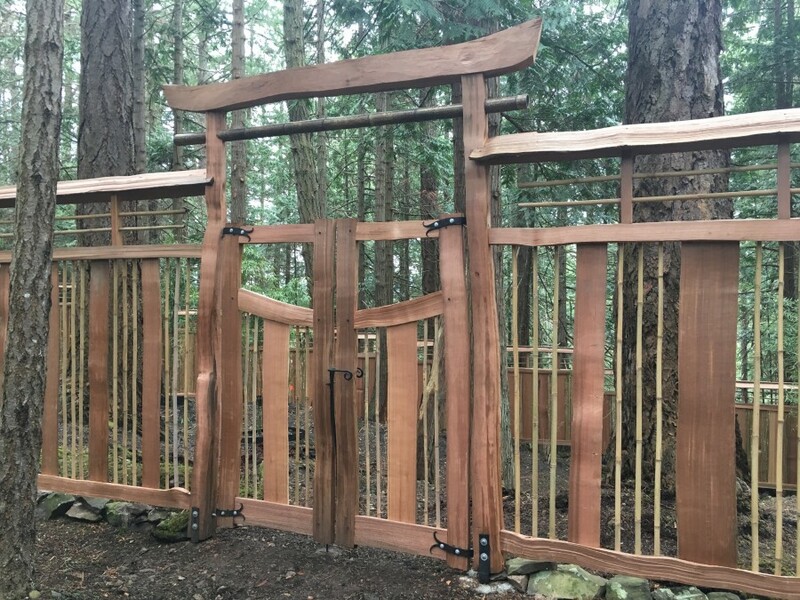 To this they added double saloon style entrance gates and I suggested a traditional torii gate entrance and the project was born. 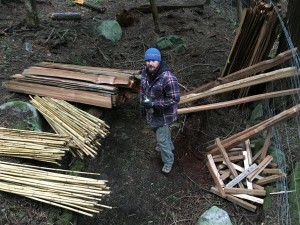 The hardest part about this project is that the location of the bamboo grove is a 10 minute hike into the forest from the main property gates, so all of the material would have to be carried in. 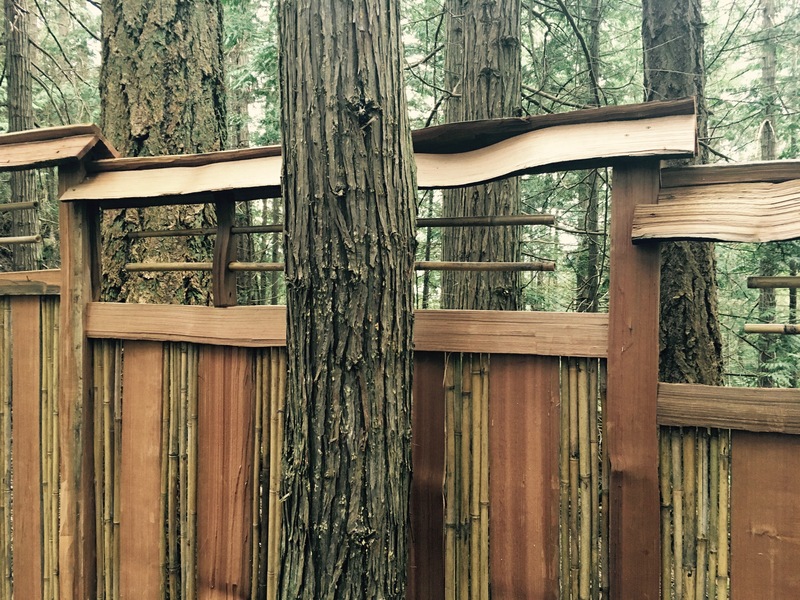 I designed the fencing to be a combination of west coast (as all the wood is salvaged red cedar from local beaches and split by hand, so no milled wood at all) and Japanese traditional with a simple roof and lots of bamboo in the fencing as well. 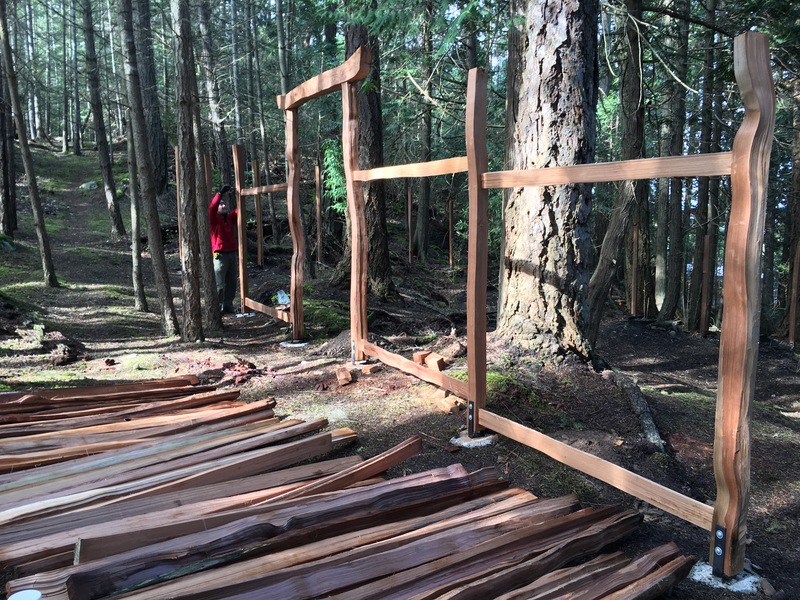 We started with digging holes and setting metal post saddles in concrete to keep the posts up off the ground so they will not rot in our wet climate. This meant wheelbarrowing 60 bags of cement/navy jack into the site, and hand mixing everything. 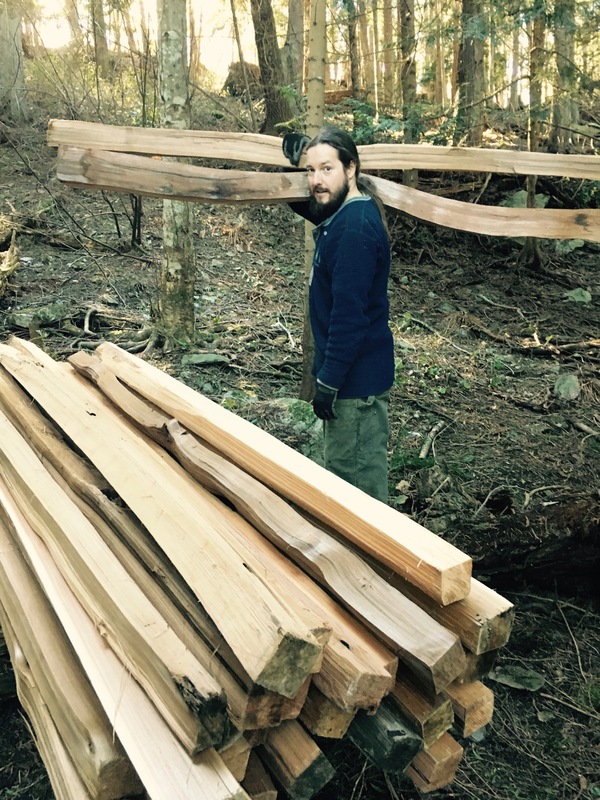 (Thanks to Shandor for his help with this part of the job!) Then I split the wood needed for the posts and rails, and carried all this material into the site with the help of my wife Wendi (who was looking for a good workout!). 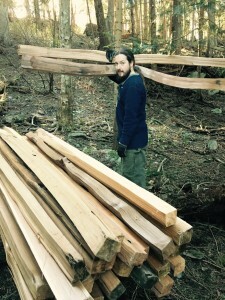 The posts are bolted to the metal saddles and the rails are notched in place and attached with 4′ screws. 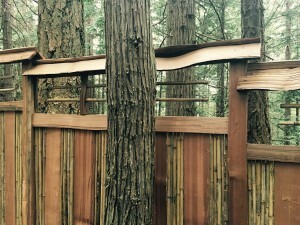 Next Wendi started installing the bamboo and cedar fence pickets to my design while I built all the roofs and upper vertical bamboo details. 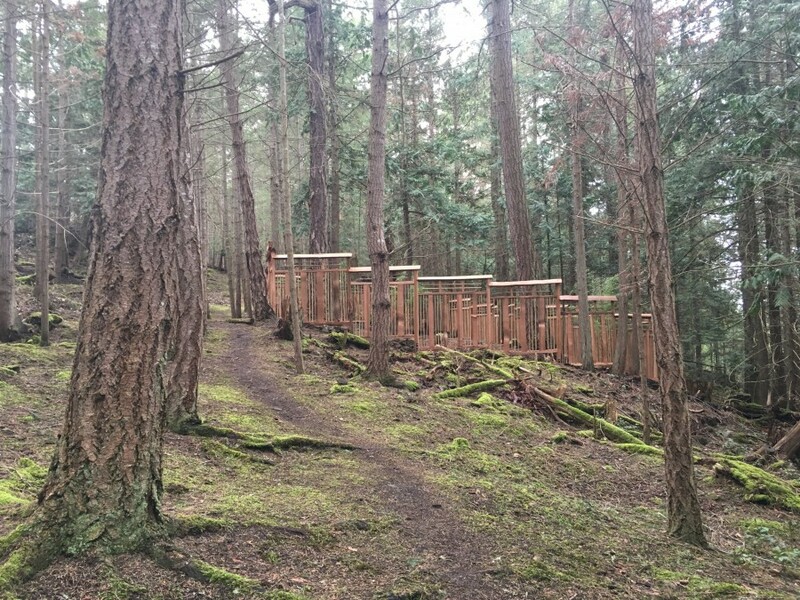 The fencing is 180′ long and mostly over varying and rough terrain. 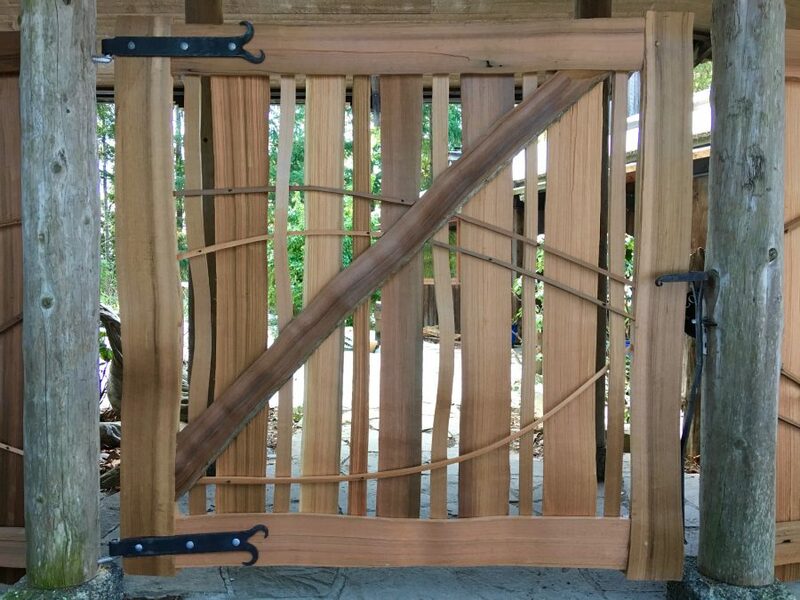 Next I built two custom hand split mortise and tenon cedar gates for the entrance I designed. 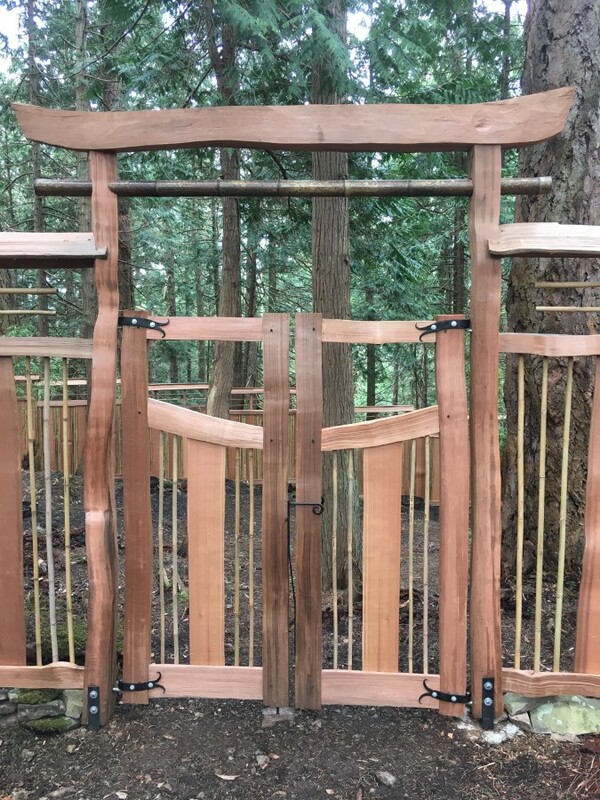 We decided to use a nice 3″ piece of bamboo under the main arbor of the torii gate, which looks great. 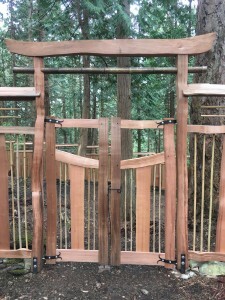 The gates are saloon style, so both swing open. 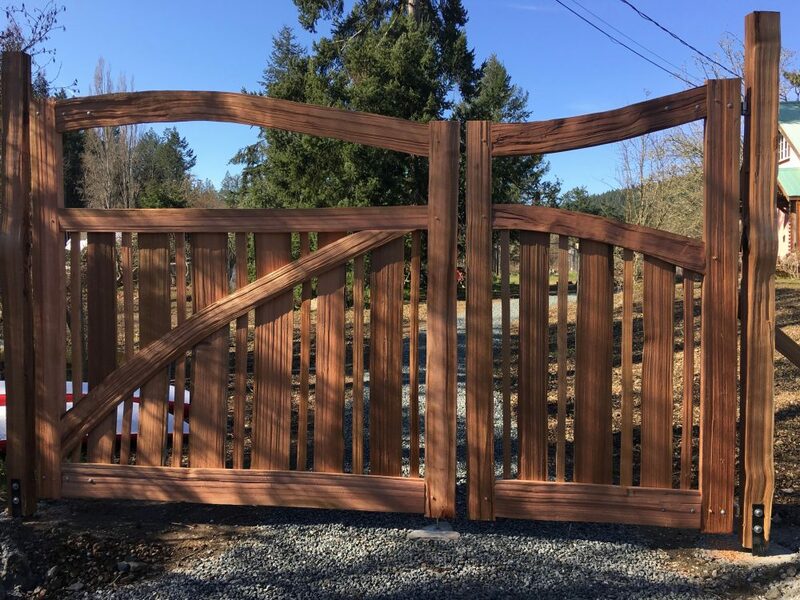 A cane bolt on the left gate (the bolt slides down into a hole in a stone I drilled and set under the gate into the ground) keeps one side secure as the owners mainly uses the right gate, unless needing to get a wheelbarrow through. I designed all of the hardware and had Justin Urbantas of Meska Ironworks custom forge all of the hardware by hand. 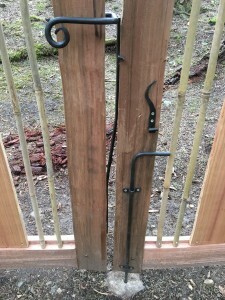 He made beautiful hand forged hinges and cane bolt, as well as the usual sprung latch and catch I use with my gates. I am very happy with his excellent work which goes so well with the rest of the project and is similar to the traditional iron hardware that would have been used with a Japanese courtyard like this over the last 500 years. 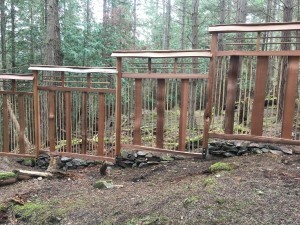 With the fence finished all that was left was to pick up rocks from the surrounding area and stack them under the fence to stop deer coming in and give the project a foundational feeling. The clients will be replanting much of the bamboo this spring and working more on the interior of the courtyard. 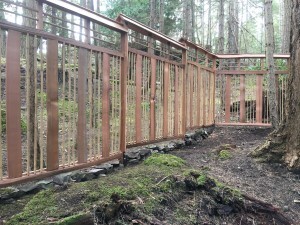 We can look forward to more pictures of this project as they fill in the space and it grows into a beautiful space to be any time of the year. 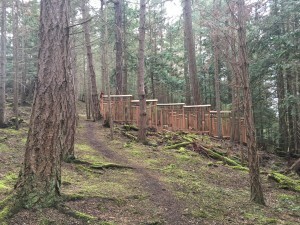 Thank you John and Monique for the opportunity to be part of this great project!